1. 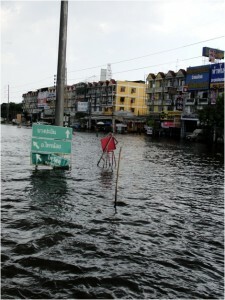 The recent floods in Thailand have been the worst the country has experienced in seven decades. The floods have claimed over 600 lives since July when the water began traveling from the north of the country, submerging agricultural and industrial areas before drowning Bangkok in October. Damages have been estimated to reach 300 billion baht (about $9.7 billion). 2. Most Thais do not have the resources to relocate from their flooded homes, which means that many communities are forced to live in areas surrounded by toxic water with little access to food. When I was in Bangkok this month, I went with a close friend to volunteer with the Thai Red Cross. We drove out on huge trucks to Sai Noi, the northwestern-most district in Nonthaburi province, outside of Bangkok. It took us almost three and a half hours to get there, driving through rancid water, mile after mile. Once we got to Sai Noi, we had to unload onto smaller boats to deliver food, water, and other vital supplies to people stranded on the second and third floor of their homes. When our boats couldn’t fit down some of the most mangled waterways, people had to wade through water chest deep (about five feet) to collect the only food they had access to in days. Their homes have been flooded for over a month, and there is no definitive answer as to when the water will recede. Every day people in Thailand continue to live surrounded by flood water that is toxic and fetid. (If you don’t know how toxic flood water is, consider what happened in New Orleans and other areas ravaged by Hurricanes Katrina and Rita: black mold that developed from the flood waters poisoned flood victims, leading to serious respiratory and skin problems.) To get an incredible visual of the flooding in Bangkok and around the country, check out this amazing photo spread put together by The Atlanitc. 3. The government response has been slow and strangled by political tension. Thailand’s new and controversial Prime Minister Yingluck Shinawatra assumed office in July 2011 and has been deeply criticized for her heinous mismanagement of the floods around the country. In Bangkok and surrounding areas, politically-motivated rumors abound: mismanagement of the floods reflects a conspiracy; certain neighborhoods are getting aid first due to their political motivations, etc. This week, PM Yingluck has taken intense flack for pushing a royal clemency decree that critics say would benefit her exiled brother and former PM, the infamous Thaksin Shinawatra, instead of focusing on the flood. All of these issues have slowed down the government’s response and detracted from the emergency relief that so desperately needs to take place around the country. In a recent post on Travelfish.org, journalist James Fahn addresses serious criticism about what caused the flooding in Thailand in addition to the more commonly cited issues (increased rainfall, climate change). First, he raises a concern highlighted by Smith Dharmasaroja, head of the Natural Disaster Warning Foundation, who believes that more water should have been released from the Bhumibol and Sirikit Dams earlier in the year so that there would be less throughout the country now. Fahn also discusses in detail how Thailand’s rapid economic development has been carried out with “no consideration for the impact on flooding” or the environment. Houses, roads and other infrastructure have been built with no thought about proper drainage systems or flood prevention measures. Fahn’s article echoes many of the concerns and criticism about the flooding raised by several of our Thai grantees. One thing is clear: the flooding should serve as a serious wake up call to the Thai government around environmental sustainability and water management. 4. All eyes have been on Bangkok, but the whole country is struggling. The monsoons began causing floods as early as July, devastating communities across Thailand. Attempts to save Bangkok from the flood waters by trapping filthy water in the areas outside the levees has been sparking tension between residents and causing outrage among those who have been living in flood waters for months. In the rest of the country, aid is scarce, and communities are struggling—literally—to keep afloat. AJWS is working with our Thai partners around the country to assess needs. We recently provided an emergency grant to Eco-Cultural Study and Restoration Center of Petchaboon Mountain Range Communities (ECSRC) in the Northeast. ECSRC is providing emergency assistance and supplies to more than one thousand families across 11 villages where four hundred acres of farm land is submerged by floods. This week, we also provided a grant to TNP+ (The Thai Network for People Living with HIV/AIDS) to provide flood-affected families seed money to repair their homes and restore their livelihoods. 5. Thailand will need help long after the water recedes. Allianz Insurance’s Asia CEO Lutz Fullgraf was quoted in a recent Bloomberg article emphasizing the long-term damage the floods will do to the country, from the closure of factories and damage to agriculture industries to the damages of buildings, calling it Thailand’s “costliest event” in terms of insured values—more than last year’s riots and the 2004 Indian Ocean Tsunami. That means less investment in the country, a continued loss of jobs, and a severely damaged agriculture sector. Who cares what Fullgraf has to say? We all should. Because it means that Thailand’s most marginalized will continue to be overlooked and our Thai partners need our help more than ever to deliver long-term relief to communities affected by the floods.